Believe it or not. This Aloe Vera started out as a 5" high plant from the local grocery store. Can you see the babies nestled snugly under the mother plant? I remove the small ones and transplant them into small containers. Then I give them away to my friends as a hostess or a friendship gift.. In the summer a 1-2 ft. long Yellow flower in dense spike atop a 3-ft stalk comes up the center and blooms. 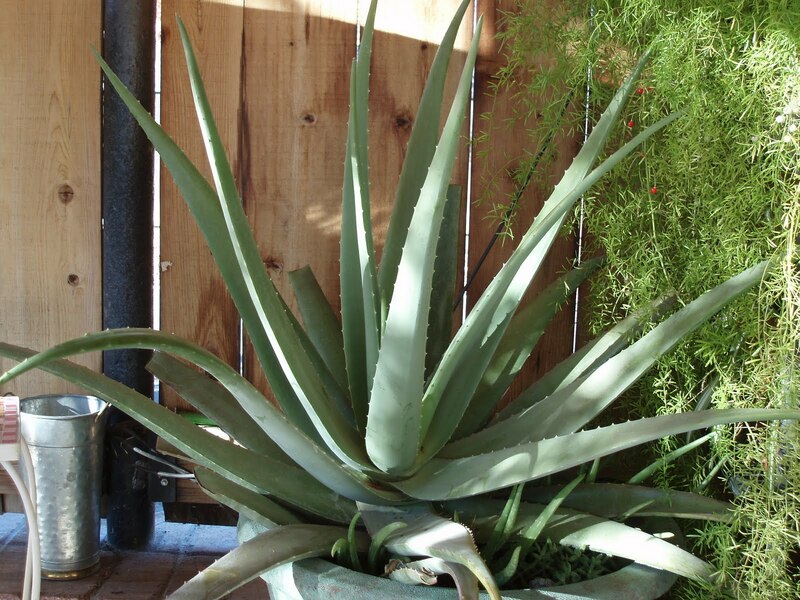 The Aloe Vera plant is a favorite folk medicine plant used to treat burns, bites, inflammation, and a host of other ills. As you can see I do not cut on the plant much. 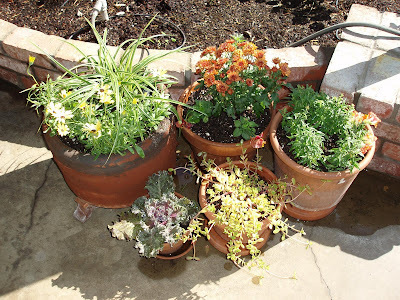 Succulents do very well in the hot and dry interior valley of California. I do have drip watering system to the pots on a timer for everyday watering. They are protected from the direct hot sun of the afternoon. As you can see by the shadow from the patio overhang it is keeping them well protected. Click on picture to see the detail of the plants. I have added some other plants. Some snapdragons and decorative cabbage. I love any grouping of plants. The color and light from the sun brings so much beauty to each plant. Just a last look at the patio. I have five different rose bushes in the center and lamb's ears surrounding the sun dial. I have a Jade Plant. I provide overhead protection for the Jade because I am in Zone 9. 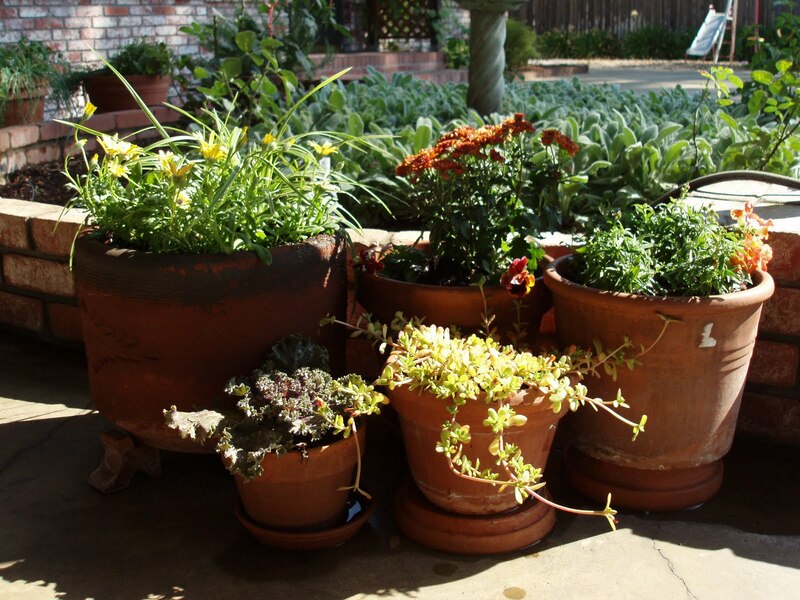 The other pots around the planter have a different kind of herb planted in each one of them. I can just walk out my back door and snip off the herb of my choice. 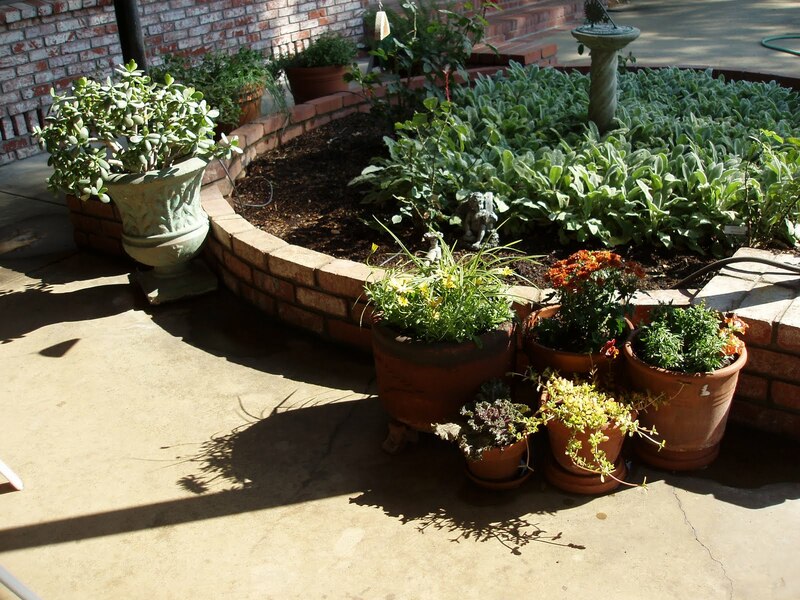 Chives, Mint, Oregano, Rosemary, Sage, Tarragon, Thyme or Parsley. Today I am linking to Outdoor Wednesday at A Southern Daydreamer. Please link back and visit the more of the Outdoors. Thank you for stopping by and please leave a comment. That is a fantastic plant isn't it! 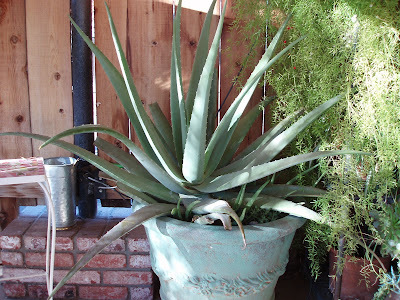 I have lots of succulents but I can't believe that I don't have an Aloe Vera-I will have to get one ASAP! I grew and used my aloe vera plants. They are esp good for burns. Hi! I have an Aloe just as large as yours...indoors! I'm from Manitoba Canada.